Japan Radiation Levels – What do they Mean? According to this morning’s reports, Tokyo officials say they detected 0.8 of a micro-sievert of radiation in the morning, which is about 27 times what’s considered normal. A chest X-ray typically involves a dose of 20 micro-sieverts. In contrast, radiation readings in Kitaibaraki city, about 43 miles (70 kilometers) south of the Fukushima nuclear plant was at 821 nanosieverts per hour as of 3 p.m. Tokyo time. 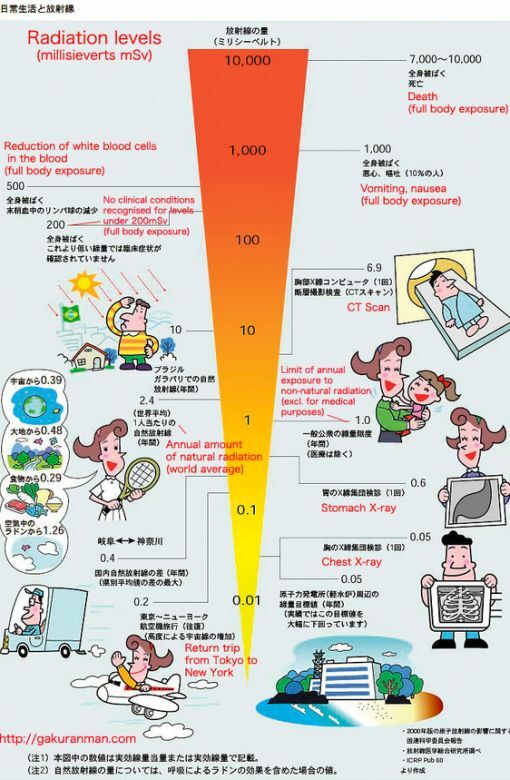 For those of us that are not familiar with radiation levels and what they mean in terms of exposure, here is a very useful diagram that Boris shared with me this morning. ← FOMC Table: How Has US Economy Changed Since Last Fed Meeting?